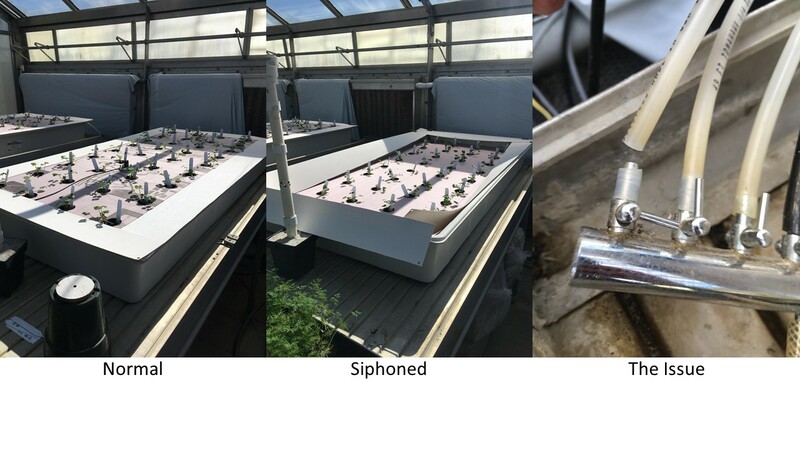 If you are growing crops hydroponically in deep-flow or raft systems, one of the last things you want to see is an unusually low or empty tank. It is not uncommon for nutrient solution levels to be reduced by evaporation and transpiration, but when levels decrease rapidly, there may be a larger issue. A common issue in nutrient film technique (NFT) or with drip systems is a leak from the tube delivering the nutrient solution. Another possibility is a crack in a tank or tube. However, what could be the cause if you do not see a leak? A less-intuitive issue that may occur is siphoning. Watch out for siphoning if you are using air stones or tubes for oxygenation in deep-flow or raft systems or reservoir tanks. Siphoning may happen if the air pump is not supplying air flow due to a broken tube or the power going out. If the nutrient solution is siphoned into the pump, damage to the pump may occur. Siphoning may also be a result of air stone tubes breaking or coming loose from the air pump. To prevent this issue, position air pumps higher than the nutrient solution reservoir. This will stop siphoning from a pump or power failure. However, if the tubing becomes loose, cracks, and falls outside of the tank beneath the water level siphoning may still occur. If feasible, consider installing in-line back flow prevention valves. Be aware this may be a problem and, if the nutrient solution is suspiciously low, check for siphoning. Roberto G. Lopez is an Assistant Professor and Floriculture/Controlled Environment Extension Specialist at Michigan State University. He has an appointment in research, teaching and extension. His area of expertise is; controlled environment specialty crop production; Lighting applications for greenhouses and indoor vertical production; light-emitting diodes; young plant propagation.